Autumn Minuet I shows an autumn scene, the work of artist Keith Mallett. In this scene we see a gorgeous silhouette of autumn trees with rich burgundy brown tones with an abstract leaf motif in the foreground. The work is a beautiful celebration of the season of autumn. Mallett's works are a mixture of the beauty of nature combined with a style which accentuates the topic in a new way. 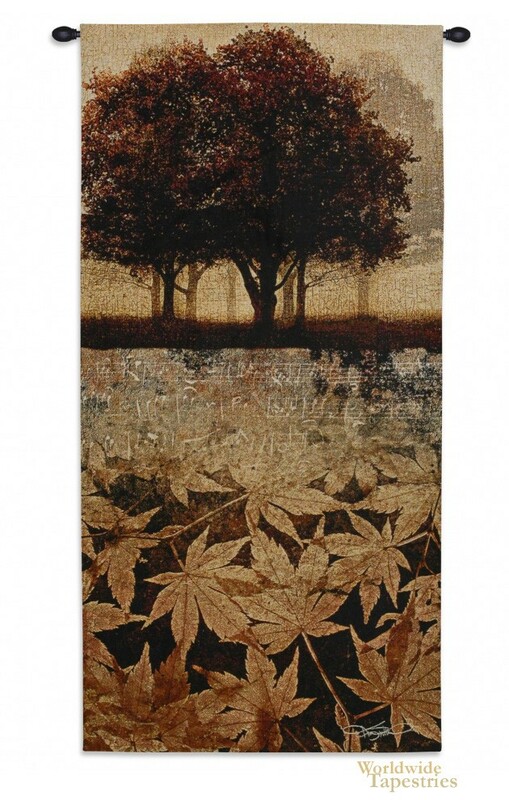 This Autumn Minuet I tapestry is backed with lining and tunnel for easy hanging. Note: tapestry rod, where pictured, are not included in the price. Dimensions: W 26" x H 52"